Manny DeWitt is a lawyer. That notwithstanding, he seems to be a good guy. He is extremely resourceful, quite smart, energetic, and at times playful. He is the go-to guy for a very wealthy Dutchman named Hans Lobbe who mixes languages with ease, though perhaps not so easy to understand. If there is a negotiation, DeWitt is sent. If there is an investigation, DeWitt is the guy. If there is a chance of getting killed so Lobbe can make a few more millions, DeWitt answers the call. DeWitt does not, however, consider himself important. He claims that just as Lobbe has a typist pool from which to draw, he has a lawyer pool. Manny considers himself just one of many. He isn't, as Lobbe routinely picks him. Except when he is fired, which apparently happens on a regular basis. Or he quits, which is also not rare. This series belongs here because the business affairs of Lobbe very often fly in conflict with the desires of other nations and that usually causes guns to fire, bombs to explode, knives to be tossed, and beautiful women to appear out of nowhere. Lobbe makes the money and DeWitt takes the risks. Of course, DeWitt is quite nicely compensated, when he forces the issue, but nothing can adequately pay for the dangers that DeWitt faces because of his boss, or the aggravation caused by his boss. DeWitt does not like violence. He has little use for guns or knives or those people who routinely use them. Unfortunately for him, his boss's strange assignments keep pushing into conflict with those people. Luckily, DeWitt knows a good lawyer. The Girl was a painting once stolen by Goering during WWII and now the object of excitement. Manny DeWitt's assignment is to find it and bring it back with him, regardless of the murder and mayhem about him. 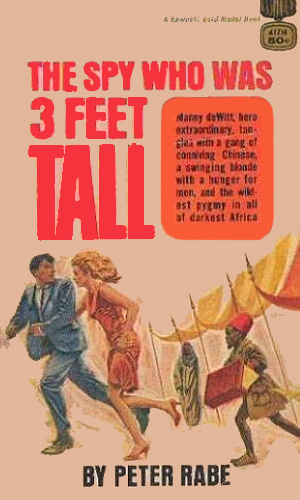 The spy in the title is an African pygmy who went by the name of Baby. The location is a new country in Africa named Motana where Manny DeWitt's employer wants to build a road and make money. The Chinese, however, don't want that. 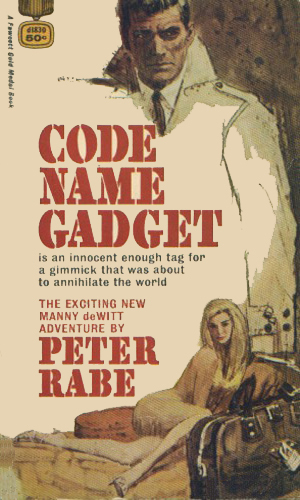 What exactly the Gadget was remained unknown but Manny DeWitt's employer was bidding for it and several countries were planning on getting it for themselves. DeWitt was in the middle, again. Light-hearted action and adventure with a terrific twisted sense of humor, though never over-the-top, is how I would describe the books about Manny. If he were a television show, I would hope the series lasted a very long time. I regret the book series didn't as I loved reading of the trouble Lobbe got DeWitt involved in and the way DeWitt found to get out. 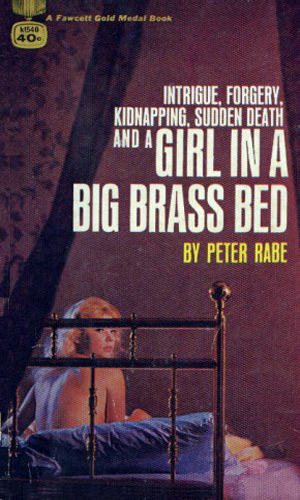 According to an interview with Mr. Rabe that I read some time ago on the MysteryFile website, the author was not particularly pleased with these books as they were quite different from what he was used to writing. I, on the other hand, was pleased. I liked Manny. Even if he was a lawyer.